Four points on last week's New York Democratic primary. Depending on your perspective, New York’s primary elections were an undemocratic shambles or a shining example of secure, party-run politics. Either way, not many people participated. The state has a history of low-turnout primary elections. In 2008, New York had the second lowest turnout rate of any primary state, trailing only Louisiana; this year, it occupies the same inglorious position. Overall turnout improved slightly from 2008, but the gains were all on the Republican side: in relative and absolute terms, the Democratic vote shrank. About 1.8 million people cast Democratic ballots in New York, compared to 1.9 million in Illinois — even though New York has one and a half times Illinois’ eligible population and a much larger share of Democrats. New York’s tightly closed primary and comically early registration deadlines did much to reduce the number of adults who were eligible to vote on Election Day. But even registered Democrats themselves didn’t cast many ballots. In Florida, nobody’s idea of a democratic utopia, over 36 percent of registered Democrats voted in the state’s closed primary. In New York, where both Sanders and Clinton campaigned much more extensively, the number was just over 31 percent. Citywide, only 30.1 percent of registered Democrats cast a ballot in the primary, a ratio that will shrink further if and when Kings County restores the 125,000 Democrats it mysteriously purged from the rolls over the winter. Compared to other large urban areas in the North, New York City’s Democratic turnout was low. In Chicago this year, over 49 percent of registered party members and independents voted in the Democratic primary. In Milwaukee, the number was at least 44 percent; in St Louis, almost 38 percent. The eligible voters in those open Midwestern primaries included many more Republican-leaning independents than in closed, Democratic New York, but their overall participation rate was still much higher. In all these higher-turnout urban elections, it might be worth adding, Bernie Sanders performed far better than he did in New York. In New York City, Hillary Clinton’s most enthusiastic support came from Democrats in rich, white neighborhoods. The New York City primary was a tale of two cities — and both of them voted for Hillary Clinton. 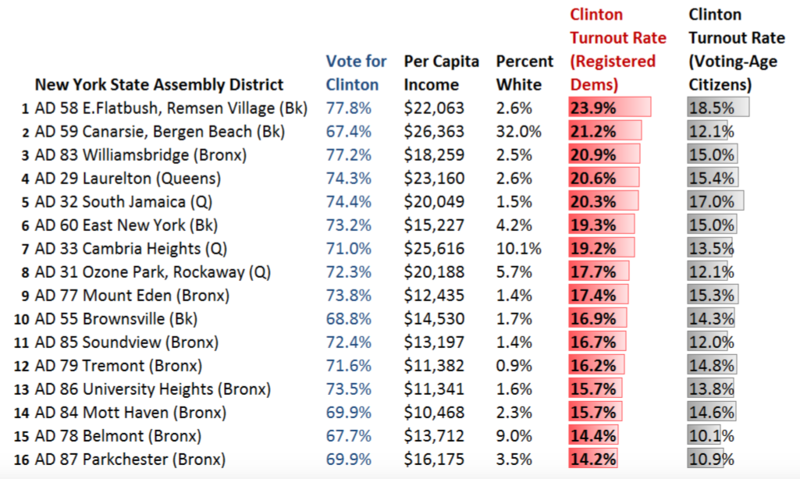 The neighborhoods that gave Clinton her most overwhelming support, as the New York Times reported, generally fell into two categories: wealthy, white parts of Manhattan and working-class black and Latino districts in the Bronx, Brooklyn, and Queens. Collectively they helped Clinton carry the Big Apple easily: citywide, she beat Bernie Sanders 63.4 percent to 36.6 percent. If you know New York City, one way to visualize the Clinton coalition is as an alliance between Park Avenue on the Upper East Side and Linden Boulevard in East New York: Clinton won over 75 percent of the electoral districts that bordered either of these two very different streets. One way to measure voter enthusiasm is to track a candidate’s individual turnout rate: that is, the percentage of registered Democrats in a given district who showed up to cast a primary ballot for that candidate. Viewed this way, Hillary Clinton’s most enthusiastic districts in New York were in the wealthier, whiter regions of city. At the neighborhood level, the enthusiasm for Clinton in very wealthy, very white areas was even more pronounced. Along the Park Avenue blocks in the Upper East Side, where average household income surpasses $200,000, and whose population is over 94 percent white, Clinton’s turnout rate often exceeded 40 percent of registered Democrats. In black and Hispanic working-class areas, Hillary Clinton’s support was broad but not especially intense. In the nonwhite areas where Clinton won just as overwhelmingly, enthusiasm — as measured by turnout — was much lower. Clinton won the entire Bronx by a landslide, beating Sanders 70 percent to 30 percent. Yet her turnout rate across the whole of Bronx County was just 16.9 percent among registered Democrats, and just 11.9 percent of voting-age citizens. Across the city, in the majority-nonwhite districts where Clinton won over two-thirds the vote, she did it by turning out a relatively small slice of voters. Of course, the enthusiasm gulf between Park Avenue and Linden Boulevard may not say very much about Hillary Clinton. It reflects the larger pattern of voting in the United States: wealthier people vote much more than poor people. New York’s restrictive registration laws surely only heighten the class disparity in voting. In this way — and not only in this way — the Clinton coalition in New York City offers a concentrated expression of the Democratic Party’s status quo: affluent, largely white, and highly motivated professional-class voters, joining forces with a largely nonwhite and significantly less enthusiastic working-class bloc. Sanders was not able to break this alliance. If Clinton struggled to turn out poor and working-class nonwhite voters, Sanders struggled even more. In the Bronx, for instance, his own turnout rate was just 7.3 percent. But when Sanders recently lamented that he has lost some primaries in part because “poor people don’t vote,” he spoke the truth. Of the 93 percent of Bronx Democrats who didn’t vote for Sanders, over 75 percent didn’t vote for Clinton either: they simply stayed home.